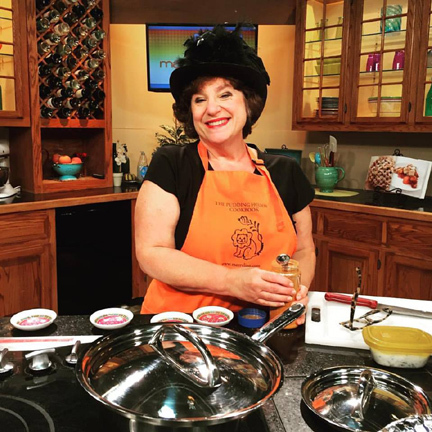 Trish Crapo, a fellow freelance writer, took this photo of me prepping the soup on “Mass Appeal” last week. We are enjoying a roller-coaster of a fall here in New England. At first we thought there might be NO color, thanks to the very dry weather of the past few months. A couple of weeks ago the trees apparently got tired of being drab and started turning gorgeous shades of orange and yellow, along with just a little red. The temperature has also vacillated. A couple of weeks ago we were routinely very cold. Last week suddenly Indian summer arrived. Over the weekend just as suddenly things turned raw and cold. I hope it doesn’t snow too soon—but I’m not sure that it won’t. It’s now officially soup weather. I love soup in any weather, but somehow it seems most fitting when temperatures are plummeting. This simple blended soup is warm, hearty, spicy, and even healthy. All the vegetables are in season—at least here in New England. Seeing cauliflower at a farm stand made me think of the wonderful spicy Indian cauliflower dish aloo gobi. My soup is loosely inspired by it. I’ve never seen aloo gobi that included carrots, but I had a ton of carrots from my farm share so in they went! Thanks to my cousin Kate Corwin for coming up with the idea of using chopped cashews (following the Indian theme) as a garnish. The gang loved that addition when I made the soup on Mass Appeal last week. Preheat the oven to 425 degrees. Roughly chop the cauliflower, carrots, and onion. Toss those vegetables in a small amount of oil, and place them on a rimmed cookie sheet. Place the garlic cloves on a small sheet of aluminum foil, drizzle a little olive oil on top, and close the foil around the garlic. Place the covered garlic on the cookie sheet as well, and roast the vegetables for 1/2 hour, stirring and turning them after 15 minutes. After removing the vegetables from the oven open the pouch of garlic and smash the cloves. Place all the vegetables in a 5-quart Dutch oven. Stir in the broth, curry powder, cumin, salt, and honey. Bring the soup to a boil; then reduce the heat, cover the pot, and simmer the soup for 1/2 hour. When it has finished cooking, blend it with an immersion blender. (You may also use a regular blender, but in that case blend it in very small batches and watch out for burning.) Just before serving stir in the lemon juice. Adjust seasonings to taste. Serve with a dollop of Greek yogurt and a few cashew pieces if you like. Serves 4 to 6. Here is the video. For some reason there is a gap in the recording beginning 42 seconds in and lasting for almost 50 seconds. Feel free to fast forward during that section! This entry was posted on Monday, October 24th, 2016 at 4:00 am	and is filed under Soups and Stews, Vegetables. You can follow any responses to this entry through the RSS 2.0 feed. You can leave a response, or trackback from your own site.